In January of 1972, a month shy of his 18th birthday, Kenn Kaufman left his home in Kansas and hitched a ride to Texas. He was a high school dropout with little money and few prospects for the future. Nevertheless, driven and single-minded, Kaufman was embarking on a quest, a quest far removed from that of a typical 18-year old. He was out to establish the record for the most birds identified in the US in one year. 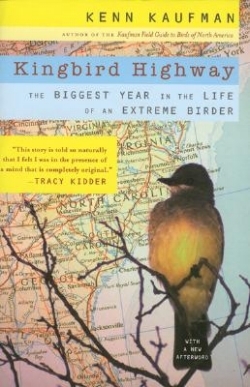 This is the story of that year-long quest: of living on pennies a day, of hitch hiking from one end of the country to the other, and of sleeping under bridges—and yet slowly, he filled his lists with birds. And what of his uncertain future? He didn’t do too badly. Have you heard of the Kaufman guides, that popular series of bird, mammal and insect guides which have sold in the thousands? Oh yes, that’s the same Kaufman. For the rest of the awards, click here.